Weighing well under five pounds with surprisingly typical dimensions for a laptop, the Psion MC-400 mobile computer was powered by a 7.68MHz Intel 80C86 processor and featured a 640x400 LCD with no backlight, 256KB EPROM and 256KB RAM, swappable 128KB flash storage drives, integrated speakers and microphone, a touchpad, and the ability to receive eight AA batteries for an estimated 30-75 hours of autonomy. Missing from the machine's otherwise impressive specification sheet is any form of network connectivity, much less Wi-Fi. 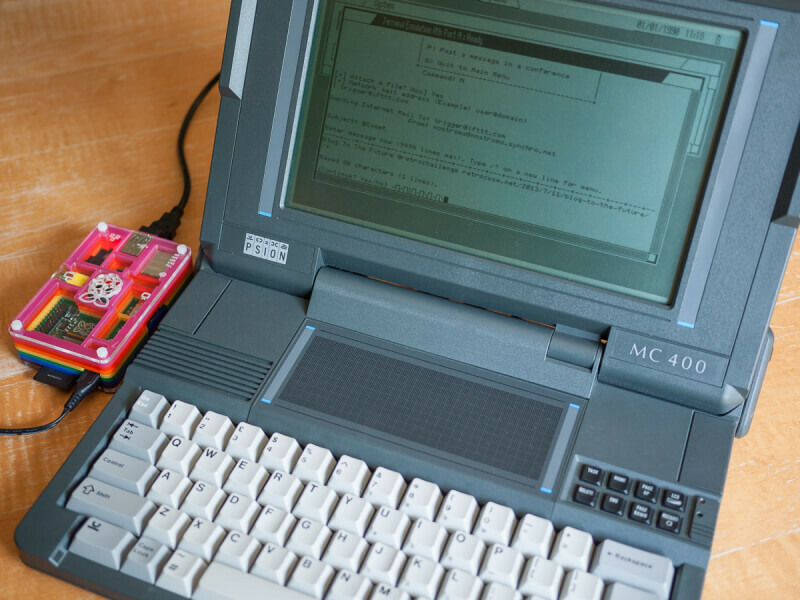 That said, it does have a serial port so if you happen to have an old MC-400 laying around, you might be able to use an RS232 serial-to-USB converter to add a wireless device.